My Visual Thinking EDC – Love. Life. Practice. I realized that I had crossed a kind of Rubicon the other day while watching a TV cop show. The assassin was in custody, but she had pulled the classic “steal a piece of pen to pick the lock on the cuffs” trick. The cop found out as soon as he tried to click the pen, and rushed to the elevator – only to see the empty cuffs and and the improvised pick. “Sloppy production,” I thought. “That’s not the kind of cartridge that goes in that pen…” Yep. I’d become one of those people, in the same way another expert I know shakes her head at the naming of plants, or the way another shakes her head at the way witches are portrayed. But that’s what happens when you dive into the deep end of something like visual thinking – you end up becoming very intimately familiar with the instruments of your craft. MEKO Stylus: I confess, this is the least-used part of the EDC. I have it in case I want to sketch something directly into my phone – the weight of it and sturdy construction make it feel really good in the hand. It also has the round nub on one end and a more “fine point” under the cap. The idea was that if my iPad wasn’t around, I could still sketch digitally…but as you can see, I’m more likely to sketch on actual paper and then simply take a picture. SketchOne Pens: I remember seeing these particular sets of pens branded as “sketchnote” sets on Neuland.com and scoffing. “Any pen can be used for sketchnoting!” And that’s true, but when I was given one free at the end of my Bikablo training I realized: these are, in fact, what I wanted to use for sketchnoting. I have them in .1, .3, .5, and .7mm widths, and they are reliable, don’t bleed, and just plain work. FineOne Brush Pen: In spite of the resemblance to dreaded “chart junk” I do find that highlights and drop shadows work well in sketchnoting. This was also a freebie to try, and it’s the perfect companion to the SketchOne set. Bonus: it is refillable and has a replaceable nib. Pilot Parallel Pen: One of the best gifts I’ve ever gotten! This comes across as a calligraphy pen (with a wedge tip) but you can use it for fine lines as well. As you can see from the illustration, I have been using it to learn the Fraktur hand (well, kind of a calligraffiti style) and absolutely loving it. Practicing a hand (way of writing) is one of those things that you can do instead of checking your phone, by the way, and I find it remarkably relaxing. “Preppy” Fountain Pen: I love fountain pens, and they get very fancy and beautiful and also are touchy and finicky and you often feel bad about risking taking them into the wild. This pen, though, gives you the joy of a reliable fountain nib along with durability and economy (get it and two cartridges for less than $10US). While I use many different pens at my desk, this is one I carry with me everywhere as my default writing instrument. Baron Fig Pocket Confidant: I’ve written before about my addiction to notebooks. 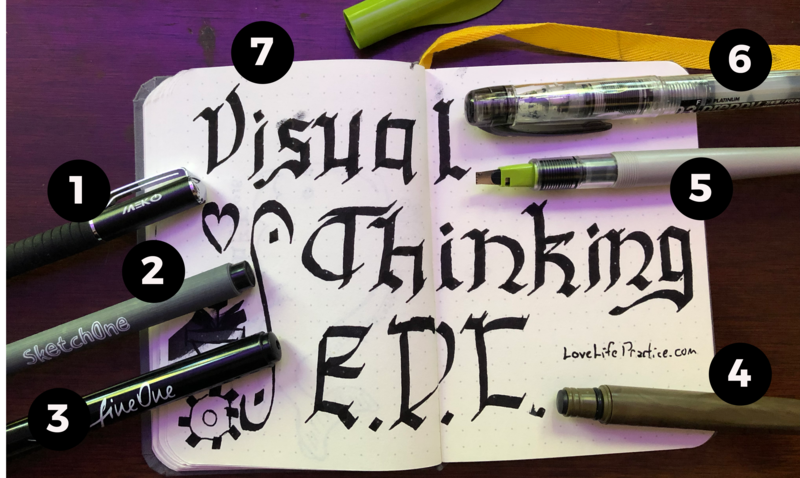 This particular choice was based on seeing Mike Rohde (the creator of sketchnotes as a practice) talk about his on the Lettering with the Masters course. It’s got a hard back which makes it easier for me to sketch things out, and the paper quality and such are unparalleled. It costs about the same as a moleskine (which I also love) or a Field Notes 3-pack (same) but just edges them both out in terms of size, quality, and ease of carry. I love the other brands (my family knows of my addiction and it makes holiday shopping easy) but this ultimately wins out. One of the biggest things I would do over if I could is to get blank pages in the notebook, not the dot grid. That choice was entirely based on me not feeling confident in my abilities as an artist. Now that I’m doing more sketching, I find those dots distracting and limiting. Having so many pens also offends my inner minimalist, and there’s a part of me that wishes I could get away with one. Theoretically one good brush pen would be capable of doing pretty much everything I have, and I’ve had my eye on the Tombow Fudenosuke Dual Tip. However, at this point that would be simply feeding my pen addiction. It’s kind of like a greased rabbit hole; easy to fall down and keep on falling. Let me know if you try any of these recommendations, and feel free to share your own favorites in the comments!